Learning with Novelty! Brain-based research shows the power of novelty and learning. 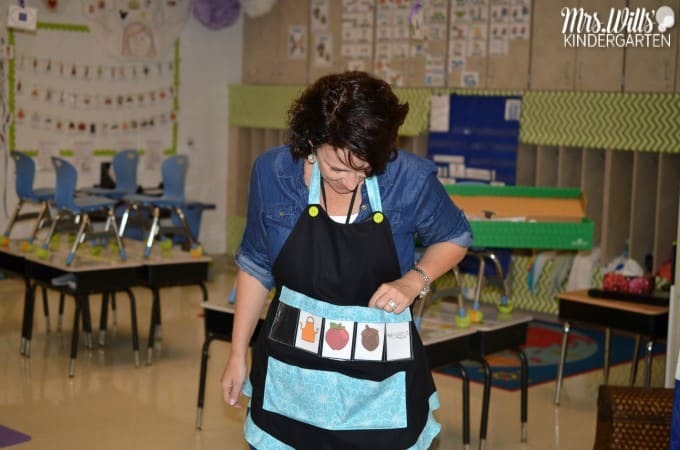 This is why I love these aprons for my kindergarten classroom. 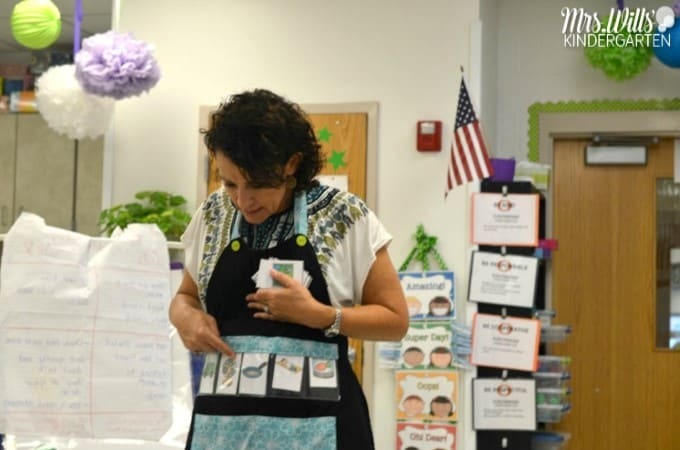 Use them for reading, phonemic awareness, math… just about any activity for your students. I love new things and so do your students! But as it turns out… it is not just the emotional response. There is actually a scientific and chemical response going on! Our brain LOVES novelty and when we mix novelty with instruction… some magical things can take place. Experts explain that our brains are wired to recognize patterns so when something new is tossed in, our brains do a little dance. Our brains sit up! Our brains take notice! If you want to read more on this, I invite you to check out this GREAT article found on Edutopia titled, 6 Tips for Brain-Based Learning. I quickly started using these in my classroom. As you can see from these photos, I have a few! I started with this sweet apron. I had a precious high school student who was conducting her teaching internship in my classroom. 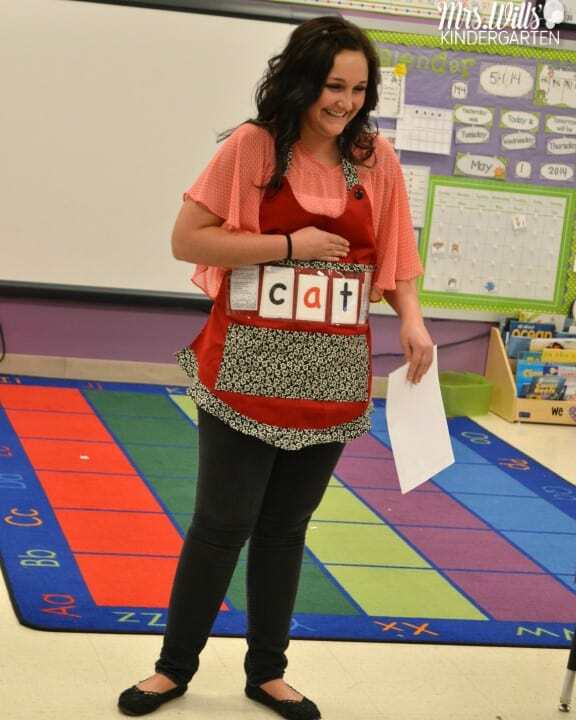 We both loved the apron, so for her final, she taught my class using it in a word ladder activity. My class simply loved it! So what is better than one apron? Two aprons! 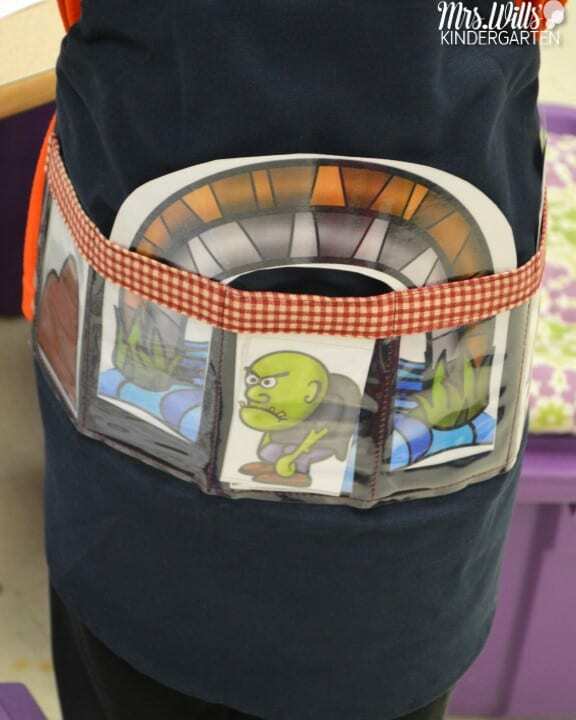 I used this apron to play odd-man out. In this activity, we were looking at initial sounds. Please excuse the chairs up on the desks, we would sneak these activities in whenever we could. Even the last few seconds of the day! In this activity, we were playing odd man out with word families a bit later in the year. 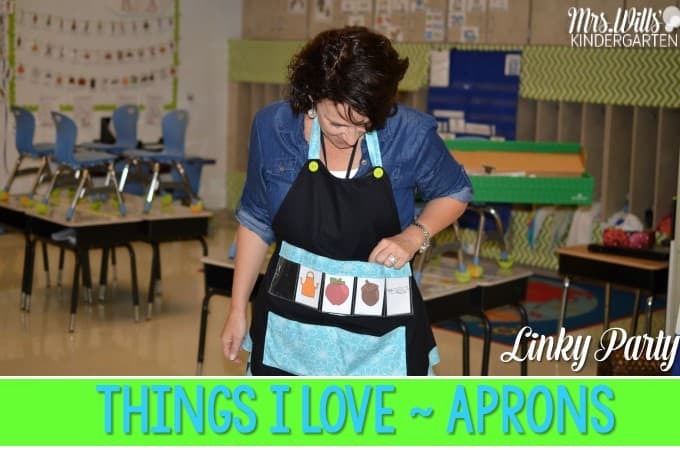 You can check out all of her Show and Tell Aprons and activity cards HERE. All of her aprons are made in the U.S.A. with love! So it is no secret that I am a fan of the apron lady, Sandy Welch. 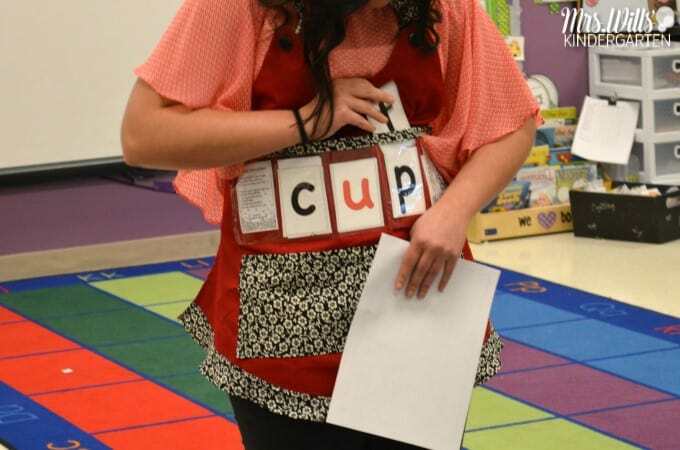 She is a kindergarten teacher, just like you. 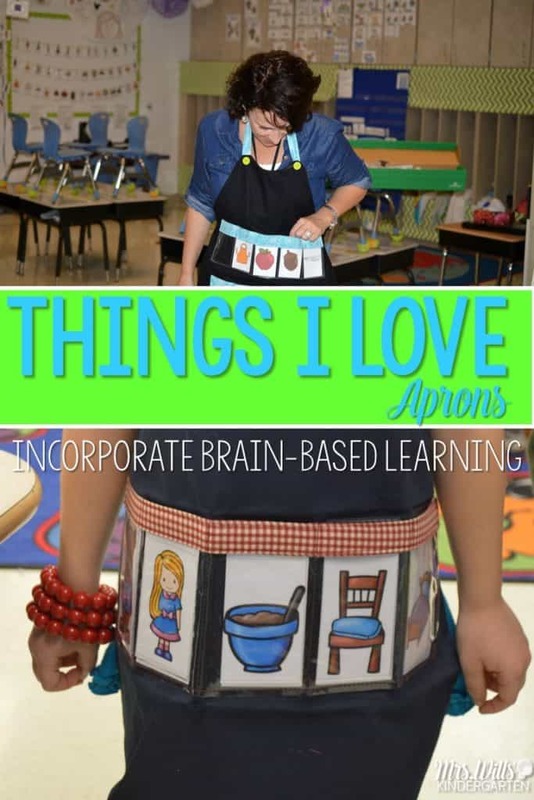 She puts her heart and soul into these aprons. Since first meeting her, I am proud to call her my friend. She is kind. She is giving. She is passionate about teaching and I love her. Naturally, I am not alone. She has a huge fan club! 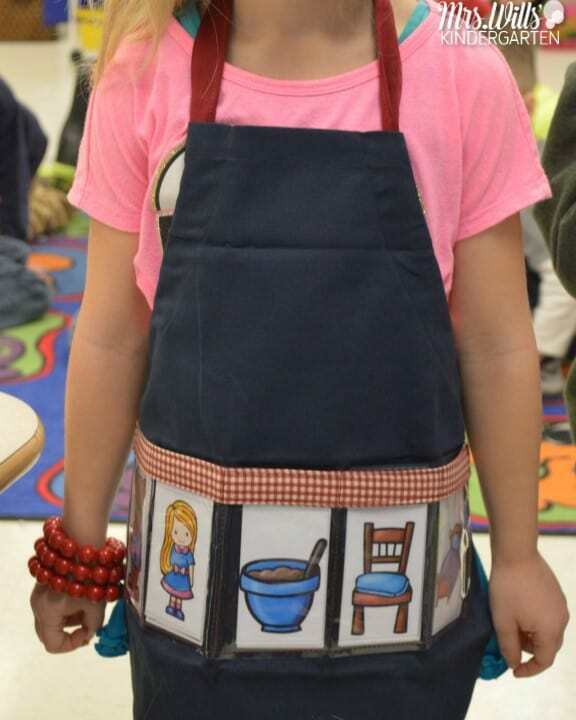 You can check out her fan club and see how they use her aprons below! Ok. Deep breath, drying my tears and composing myself. Deedee Wills…in case people don’t already have this figured out, you have the kindest heart. KINDEST. This is without a doubt the sweetest thing ever. I’m so very, very touched by your apron support, but even more for your friendship. How do you thank someone properly for things like this? AND, this isn’t the first time!!! You know, this couldn’t have come at a better time! I was near tears this weekend because I had to cut the fabric for the new aprons (not my thang) and deliver to the seamstress who doesn’t make buttonholes. This means that I have to beg friends (talented quilters) to make the buttonholes for me before the next conference. Funny how no one is answering their phones! I think they’re boycotting me! Seriously, I appreciate your thoughtfulness so much. I will pay it forward.<3 Many hugs! I meant every word sweet friend! It is exciting to see all the ideas! I so AGREE! Thank you for sharing your ideas with your grateful readers. You are a wealth of information and ideas. I love that you shared this post with us. 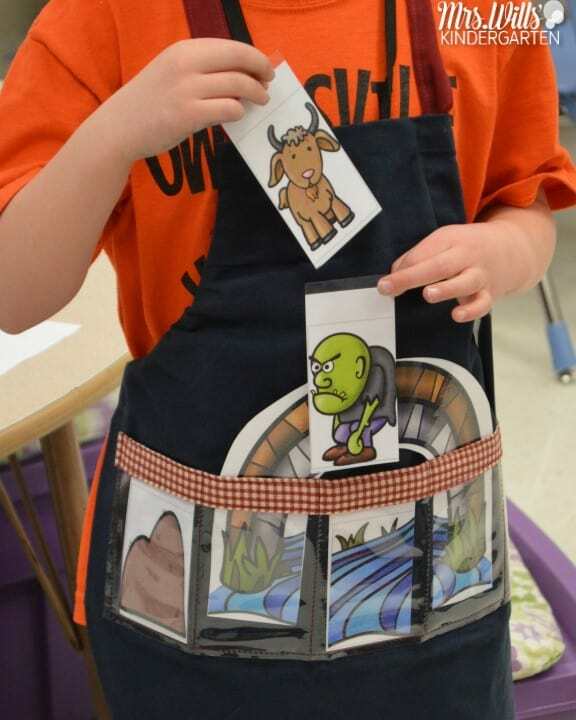 It is such a creative idea and can be used in so many ways. As a person fairly new to kindergarten, I’m always learning new things from you. I just bought my first apron at the So Cal K conference and I found Sandy “the apron lady” to be the sweetest sales person at the whole conference. She actually talked me out of buying one at first and encouraged me to think about it which I did over night but I went back and boughtone the very next day and I can’t wait to use it! I agree! I sincerely think she is a little saint in a teacher’s body! I attended the Kinder conference in Pasadena this past weekend, loved your presentations (yes I attended several). Found you entertaining and full of great information, thank you! Thank you so much!!!! I had a great time!